What's The Minor Blues Scale? The minor blues scale or "blues scale" or "pentatonic blues scale" contains the same notes as the minor pentatonic scale, including a flat fifth (b5) between the fourth and the sixth referred to as the "blue note". This is a hexatonic scale, it is made up of six notes just as the major blues scale. 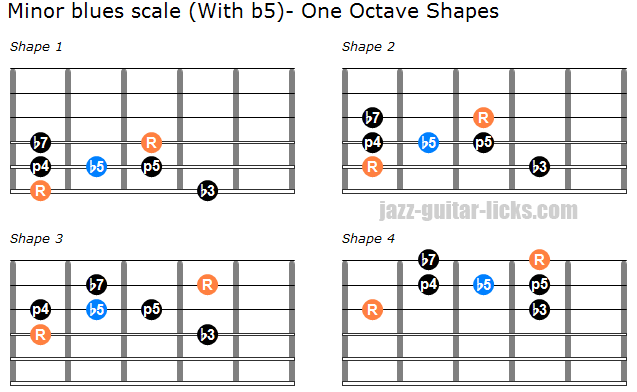 This scale is very popular in jazz music and widely used by legendary jazz guitarists as Wes Montgomery, Grant Green, Kenny Burrell, or Georges Benson. It's a simple and efficient scale, easy to learn, easy to memorize and very useful when you want to bring bluesy lines to your jazz guitar improvisations. 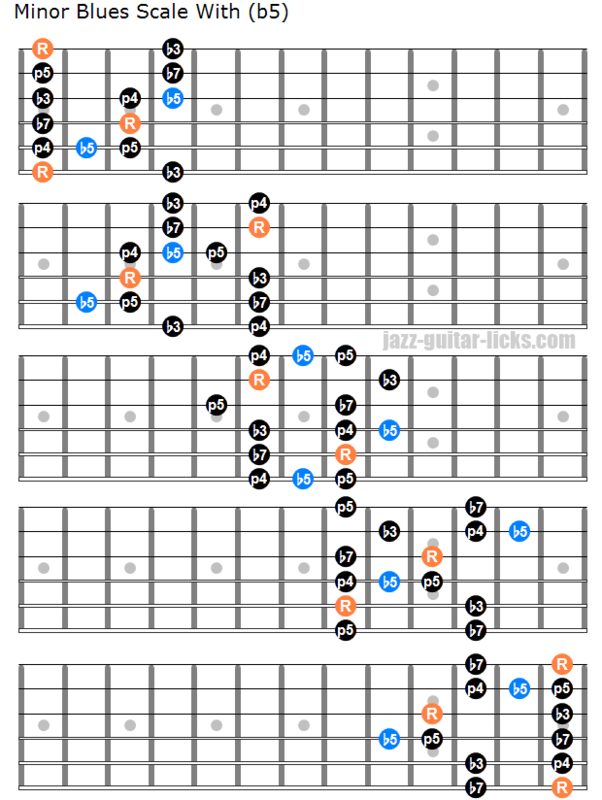 This scale is a must know for anyone who wants to start learning jazz guitar improvisation. What is The Blues Scale Formula? As previously discussed the minor blues scale contains an additional note in comparison with the minor pentatonic scale. As its name implies the minor pentatonic scale is made up of five notes : root, minor third, perfect fourth, perfect fifth and minor seventh. The minor pentatonic blues scale formula is root : (1), minor third (b3), fourth (4), flat fifth (b5), fifth (5) and minor seventh (b7). It contains six notes. The minor third (b3) can be considered as b10 or #9 just as the flat fifth (b5) can be thought as #4 or #11. You can apply the minor blues scale over the same chords as the minor pentatonic scale. Minor blues scale can be devided into three groups, depending on the added note. Indeed, there are three blue notes, the major third (3), the flat fifth (b5) and the major seventh (7). It means that you can add one of these three notes to the common pentatonic scale, thus giving three different minor blues scales. One minor pentatonic scale with a major third, one with a flat fifth and two with a major seventh. How to Play the Minor Blues Scale on Guitar? The four guitar diagrams show how to play the minor blues scale starting from the sixth, fifth, fourth and third string. Here are five guitar positions for the minor blues scale. It is important to locate the root note (R), which is the orange note in the diagram. This note is very important, it will help you transpose the scale. How to Use The Minor Blues Scale Over a Blues? This easy short jazz guitar lick shows you how to apply the minor blues scale over the first two measures of a classic blues progression in the key of A. Indeed you can play a A minor blues lick over a dominant 7th chord, which is a major chord. Before talking about this lick, it's important to understand how to build a 12-bar blues progression, this is the basis before learning blues, jazz lines. A basic blues progression most of the time is made up of 12 bars with three chords of a given key. In the line below, there is no clash between the minor third of the minor blues scale and the major third of A7 because the minor third is not played here. As you can see in bar one it starts with the fifth (5) then the minor seventh (b7), fifth again, root (R), minor seventh, fifth and the blue note, the flat fifth as a chromatic passing tone between the fifth and the fourth. In bar two the fourth (D) is the eleventh of D7 and the minor third (C) is the minor seventh of D7. It works perfectly. How to Play the Minor Blues Scale Over a II V Sequence? The minor blues scale can also be played over a major II-V sequence. This progression is widely used in jazz blues / bebop heads. This II-V sequence is in the key C, to build it you must play the second and the fifth chord of the C major scale which are Dm7 and G7. Here is a blues jazz progression in the key of C including a II-V sequence on bars 9 and 10. This lick is built with notes from the D minor blues scale over Dm7 and notes from the G mixolydian scale over G7. This Bb7 soul jazz guitar lick starts with a chromatic line (Eb-E-F) including "the blue note". This line is repeated an octave higher and repeated again at its original pitch.